1. Place the chicken breasts into a large shallow bowl. Pour over the buttermilk and leave to marinate for 2 hours or overnight if time allows. 2. Preheat the grill to medium high. In a large shallow bowl, mix together the breadcrumbs, lemon zest, chilli flakes, 1 tbsp oregano and the parmigiano reggiano. Remove the chicken from the buttermilk, shake off the excess and then coat in the crumbs. 3. Spray the chicken with a little olive oil and place on a baking tray. Grill for 15 minutes or until golden and cooked through, turning halfway through. 4. Meanwhile, preheat the oven to 220ºC, gas mark 7. Place the courgettes in a shallow ovenproof dish, drizzle with balsamic vinegar and scatter with the remaining oregano. Spray with a little olive oil, then bake for 10 minutes. Top with the cherry tomatoes and bake for another 8-10 minutes or until the courgettes are just tender and the tomatoes have softened. 5. 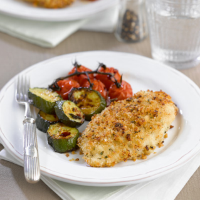 Serve the chicken with the tomatoes and courgettes. This recipe was first published in Mon Feb 11 13:50:00 GMT 2013.